At Home with Chas: Dehydrating! 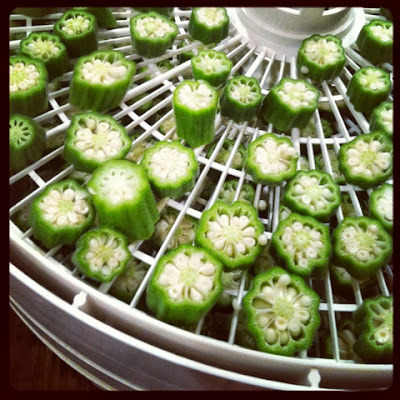 Did you know that a very remarkable tool to have in your kitchen is a dehydrator? Dehydrators are not just for beef jerky or fruit leather. They are a great tool for those of us who like to put a little extra on the shelf. If disaster strikes and power goes out, our freezers will be lost. But, those things that we have taken the time to save and put on our shelf/canning pantry will be ready for use! I didn't realize this one. Cut it up. Lay it out. Turn on veggie setting. Let it dry til crisp and firm. Store in jars or vacuum seal! There are PLENTY more. This is just a scratching of the surface. Break out that machine and get to it. It is very standard and basic and does the job just fine. There is a good bit more space to dehydrate on this model. I have a friend who owns this and loves it. So maybe you have your own pushed back on a shelf collecting dust somewhere. You thought it was only for making jerky or drying apples. Dust it off and try some of your favorite fruits, vegetables, herbs or meat dehydrated today! I love my dehydrator I just did my over grown green beans for my winters soups, now I'm off on apples....yum!